Complete your home improvements with the unique edgeless design of our Sweet range door furniture. 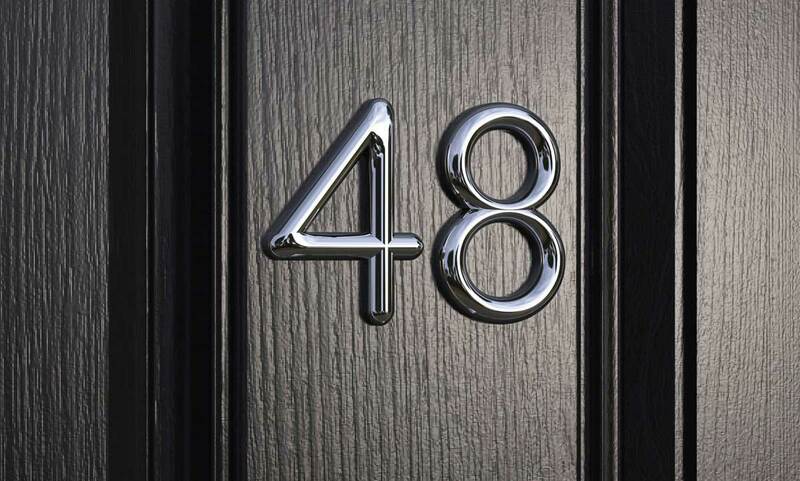 Sweet seamless curved edge door furniture is now standard on all Kingfisher Trade composite doors, including letterplates, knockers and numerals. This timeless design from market leaders Sweet allows our doors to blend in perfectly with any architectural style, and offers a weather rating of 8000 hours. Wow your customers with this unique design, and work with the best in the business. Nothing reinforces the capabilities of modern composite doors like the latest security details, and that’s one of the many reasons that we’re upgrading our composite doors to make the most of the Sweet range. By working with Kingfisher, you can offer your customers the amazing locking mechanisms and the Lock Lock system as an upgrade for maximum security. We’ll be able to supply the perfect product, no matter the furniture your customer is in the market for. Our single element door knockers for example are built with a basic face fix, symbolising the simplicity of the Sweet range. Similarly, the removal of a traditional squared frame in favour of a simple ‘edgeless’ design makes for a smart looking letterbox. Sweet seamless curved edge door furniture is now standard on all Kingfisher Trade composite doors, including letterplates, knockers and numerals. This timeless design from market leaders Sweet allows our doors to blend in perfectly with any architectural style and offers a weather rating of 8000 hours. Wow your visitors with this unique design, and work with the best in the business. Nothing reinforces the capabilities of modern composite doors like the latest security details, and that’s one of the many reasons that we’re upgrading our composite doors to make the most of the Sweet range. By working with Kingfisher, you can experience the latest locking mechanisms and the Lock Lock system as an upgrade for maximum security. We’ll be able to supply the perfect product, no matter the furniture you’re in the market for. Our single element door knockers for example are built with a basic face fix, symbolising the simplicity of the Sweet range. Similarly, the removal of a traditional squared frame in favour of a simple ‘edgeless’ design makes for a smart looking letterbox. The Sweet range of products covers all aspects of the door, so your customers can tailor their product to their exact wants and needs. 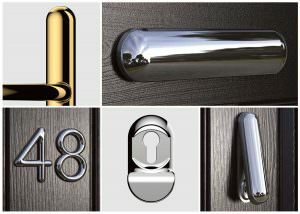 We offer split spindle pad and lever/lever handles, letterplates and knockers, numerals and escutcheons and finally cylinder pulls and the famous Lock Lock security handle. One of the most immediate benefits of this stunning product range can be found within its design. The Sweet range of door furniture stands out from the competition thanks to its radiant simplicity. We call this the ‘curve appeal’, and every element of the Sweet brand is designed to offer long-lasting beauty. 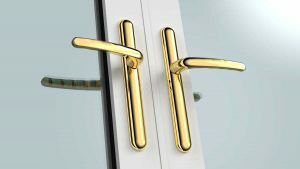 If your customers are after durable door furniture then you can direct them to the Sweet range. Every one of our products has been built to withstand a lifetime of usage. The nickel/copper multi-coating is guaranteed to look great for 5000+ hours, 20 times longer than the EN1906:2012 corrosion standard. We have five distinct colour options available so that the Sweet range will blend in beautifully with any property design. Your customers can select from Gold, Black, Chrome, White and Stainless Steel depending on both their personal preference and the existing aesthetic style prevalent in their home. One of the most important aspect of any door-related product is the security that it adds to the home. With the Sweet range though, there’s no need to worry. Depending on customer preference, they can select from the 3-Star Ultion thumb-turn cylinder lock or the incredible Lock Lock security handle, both of which are a great choice. We’re so sure of the quality of this amazing product range that we’re willing to make you and your customers an incredible offer. Kingfisher guarantee that your Sweet range door furniture will remain sweet and secure for 10 whole years. That way the customer can rest assured that they’re protected by the best products around. The Sweet range of products covers all aspects of the door, so you can tailor your product to your exact wants and needs. 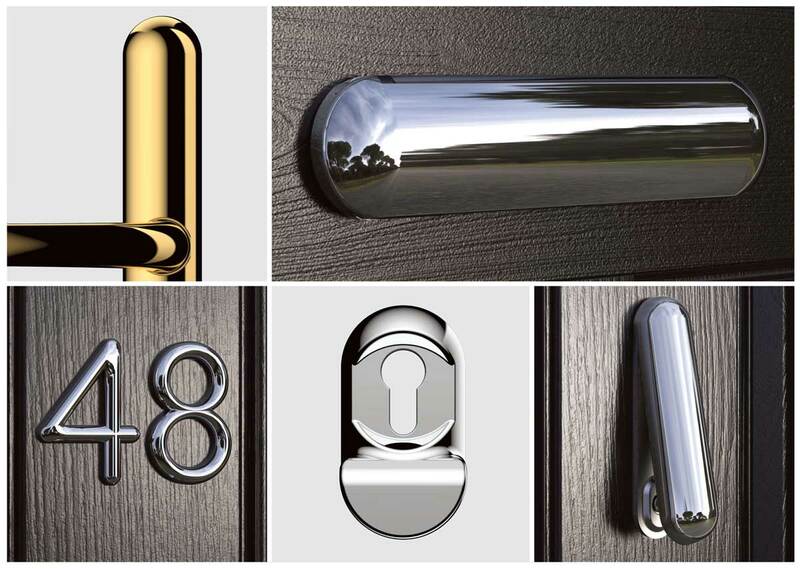 We offer split spindle pad and lever/lever handles, letterplates and knockers, numerals and escutcheons and finally cylinder pulls and the famous Lock Lock security handle. 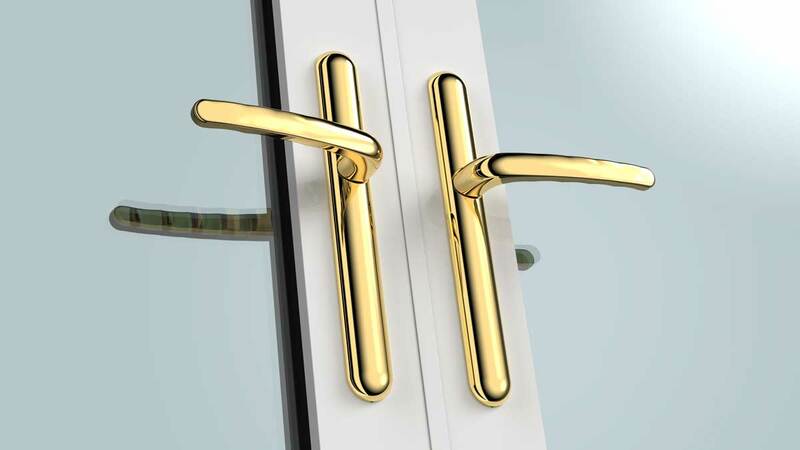 If you’re after durable door furniture, then the Sweet range is right for you. Every one of our products has been built to withstand a lifetime of usage. The nickel/copper multi-coating is guaranteed to look great for 5000+ hours, which is 20 times longer than the EN1906:2012 corrosion standard. We have five distinct colour options available so that the Sweet range will blend in beautifully with any property design. You can select from Gold, Black, Chrome, White and Stainless Steel depending on both their personal preference and the existing aesthetic style prevalent in their home. One of the most important aspect of any door-related product is the security that it adds to the home. With the Sweet range though, there’s no need to worry. Depending on your preference, you can select from the 3-Star Ultion thumb-turn cylinder lock or the incredible Lock Lock security handle, both of which are a great choice. We’re so sure of the quality of this amazing product range that we’re willing to make you an incredible offer. Kingfisher guarantee that your Sweet range door furniture will remain sweet and secure for 10 whole years. That way you can rest assured that you’re protected by the best products around. Why Choose the Sweet Range? There are a number of benefits that make the Sweet range of door furniture the best choice for your customers’ home improvements. 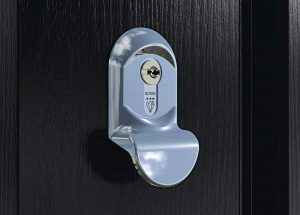 Reinforced security options are one said feature, keeping every home safe with the latest locking mechanisms. However, the longevity and sheer versatility of the Sweet range are two other remarkable points to make to potential buyers. The corrosion resistant nature of Sweet range products, combined with their slender look, make for a truly modern product. Your customers can feel protected with the Sweet range complementing their already impressive composite doors. Both the dedicated 3-Star Ultion cylinder lock and Lock Lock security handle are fantastic security mechanisms that are incredibly capable of keeping unwanted visitors at bay. In fact, they are so secure that the Sweet range has been BSI Kitemarked, commended by the Secured by Design initiative, and recommended by the Sold Secure testing house. There are a number of benefits that make the Sweet range of door furniture the best choice for your home improvements. Reinforced security options are one said feature, keeping every home safe with the latest locking mechanisms. However, the longevity and sheer versatility of the Sweet range are two other remarkable points. The corrosion resistant nature of Sweet range products, combined with their slender look, make for a truly modern product. 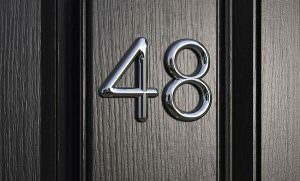 You can feel protected with the Sweet range complementing your already impressive composite doors. Both the dedicated 3-Star Ultion cylinder lock and Lock Lock security handle are fantastic security mechanisms that are incredibly capable of keeping unwanted visitors at bay. In fact, they are so secure that the Sweet range has been BSI Kitemarked, commended by the Secured by Design initiative, and recommended by the Sold Secure testing house. If you think that your customers would benefit from the extraordinary features of modern door furniture, then get in touch with Kingfisher today. Our specialists would be happy to advise you and to answer any questions you have. Call us up today on 01132 854 985, or email our trade support team at trade@kingfisherwindows.co.uk. If you think that you could stand to benefit from the extraordinary features of modern door furniture, then get in touch with Kingfisher today. Our specialists would be happy to advise you and to answer any questions you have. Call us up today on 01132 854 985, or email our support team at domestic@kingfisherwindows.co.uk.